The principle service is Holy Eucharist at 9 a.m. on Sunday morning. It begins with a procession of the lay ministers and clergy entering the church at the altar as everyone sings the opening hymn. Soon, after some prayers and Scripture readings, will come the Gospel procession, in which the Book of the Gospels is brought out to the center of the nave, where the deacon reads the passage for the day. Then at the offertory, the ushers bring up the bread and wine for communion, after which they receive the collection plates for the offering. After the offering is collected the ushers bring the plates back up to be received at the altar. And finally, when the service comes to an end, everyone remains standing while the ministers depart in, you got it, a procession. Each of these processions is lead by our Verger, Homer. 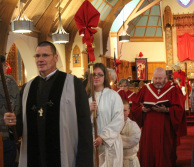 He is the first Verger in the Diocese of Eastern Oregon. 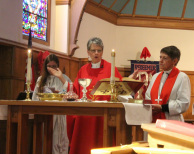 The altar is the central focal point in an Episcopal Church. (Technically the area inside the altar rail is called the sanctuary, and the area where the congregation sits is the nave.) The first half of the Holy Eucharist is referred to as the Liturgy of the Word and takes place mostly at the lectern and the pulpit (or on the floor of the nave if that is where the preacher decides to stand). The second half, the Liturgy of the Table, takes place at the altar. This part of the service begins with the offertory, when the bread and wine are brought up to the altar. You are welcome! The Communion Table is Christ's Table and all called to join Him are welcome. Come forward for the consecrated bread and wine, or just the bread. If you prefer, come forward for a blessing instead of communion. Simply cross your arms over your chest when you are in front of the Priest. And after the service, please join us in Crysler hall for coffee and conversation. After the liturgy was revised in the 1970s, Episcopalians have been kneeling less and standing more. Most of us still kneel for the General Confession, for the Prayers of the People, and for certain prayers during Lent. And some people just find kneeling more conducive to an attitude of prayer. We﻿ hop﻿e you will do what makes you feel comfortable. Generally we sit for the readings and the sermon, and stand for the hymns, Gospel reading, prayers and the Eucharistic celebration at the altar. You may notice that some people genuflect (kneel briefly on one knee) at certain points in the service, many bow (for example, when the cross passes in procession) and at other times make the sign of the cross (at the Absolution following the Confession, for example). These are personal expression of devotion that some, but certainly not all, find meaningful in their worship. If you are not used to this, you may wonder what you should do. Do as the Spirit leads and don't worry about what others may think. They probably won't even notice. In our worship, we use the Book of Common Prayer 1979 and the Hymnal 1982. Most of the service is conveniently printed in the bulletin so we no longer have to juggle two books to follow the service and the hymns. Typically you need only the bulletin and the Hymnal. You'll notice that much of our service comes from the Bible - an Old Testament reading, New Testament reading, Gospel reading and a Psalm. Plus, two thirds of the Prayer Book is taken directly from Scripture.